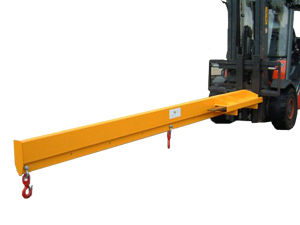 BFS jibs and crane hooks effectively transform a forklift into a mobile crane, handles the long and awkward loads which cannot be safely handled by a conventional forklift with great efficiency. They have excellent strength:weight ratios. 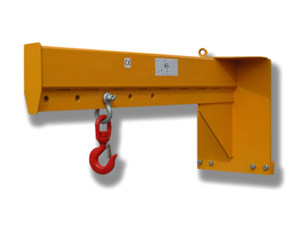 All crane hooks are supplied complete with safety swivel hook and shackle. “BB” denotes ball bearing safety swivel hook for easier load rotation. “PB” denotes plain bearing safety swivel hook (economy version). 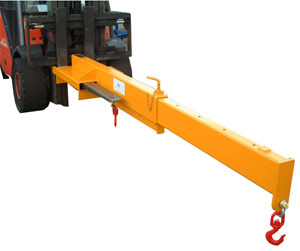 BFS crane hooks effectively transform a forklift into a mobile crane, handle awkward loads which cannot be safely handled by a conventional forklift with great efficiency. They have excellent strength : weight ratios. 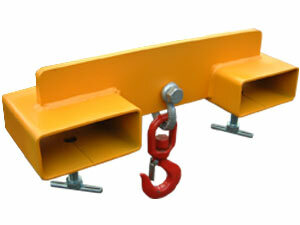 All crane hooks are supplied complete with safety swivel hook and shackle. Its position along the forks can be easily adjusted, but not to be used on the taper. A simple low cost means of “craning” loads. Clamps directly onto parallel section of fork blades. Economical means of converting a forklift into a crane in seconds. Ideal standby where lift height is not an issue. Supplied with safety swivel hook and shackle. Any length or capacity available. Popular models shown below have 4 lifting points from 1000 to 1750 mm. Exceptional strength to weight ratio. Example: Choose the JLF/3/1750 for trucks 750 to 3000 kgs capacity. Any length, capacity or mounting type available. For your trucks approximate capacity with a jib fitted, please see Jib Capacity Table. Versatile yet economical, allows long loads to be carried out in front eg in/out shipping containers. Supplied with safety swivel hook and shackle. Any length or capacity available. 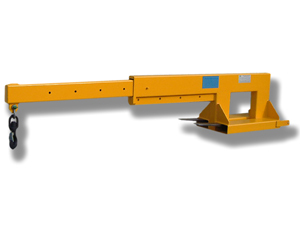 Popular models shown below, 2000 mm retracted, 3000 mm extended, 9 lifting points at 1000 to 3000 mm. Exceptional strength to weight ratio. Example: choose the JLFX3/3 for trucks 750 to 3000 kgs capacity. Forklift to crane in seconds, simply drive in and secure to forks. An excellent and essential standby for handling the occasional long/awkward load. Supplied with safety swivel, hook and shackle. 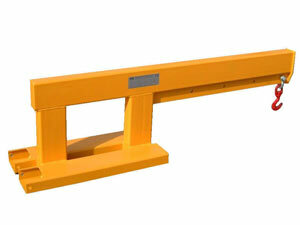 Popular models shown below have 4 lifting points from 1000 to 1750 mm. Exceptional strength to weight ratio. Example: Choose the JF/3/1750 for trucks 750 to 3000 kgs capacity. The ultimate standby crane, with the versatility of manual length adjustment. (Hydraulic adjustment also available). Ideal for reaching over machines, handling very long bars or bundles and extending the “reach” of tele handlers. Supplied with safety swivel hook and shackle. Any length or capacity available. Popular models shown below are 2000 mm retracted, 3000 mm extended. 9 lifting points at 1000 to 3000 mm. Exceptional strength to weight ratio. Example: Choose the JFX/3/3 for trucks 750 to 3000 kgs. Designed to mount directly onto the truck carriage. 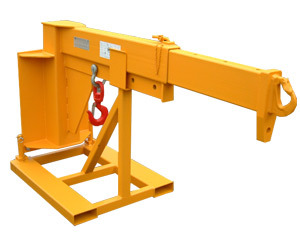 Most commonly used as a workshop crane, this type of jib is ideal for handling awkward loads on and off machines. Supplied with safety swivel hook and shackle. Popular models shown below have 5 lifting points from 750 to 1750 mm. Designed to mount directly onto truck carriage. 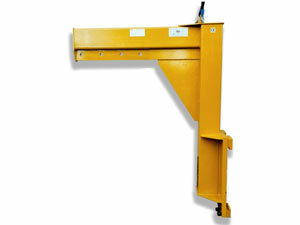 Most commonly used as a workshop crane, this type of jib is ideal for handling awkward loads on and off machines. A versatile jib having manual length adjustment (hydraulic available), whilst maintaining manoeuvrability when retracted. Supplied with safety swivel hook and shackle. Popular models shown below are 2000 mm retracted, 3000 mm extended. 10 lifting points at 750 to 3000 mm. Any length, capacity or mounting type available. Options at extra cost: Photo shows slightly raised jib, fixed hook on the end, jib stand. Designed to increase lift height, whilst minimising mast height. “The” choice for machinery movers. 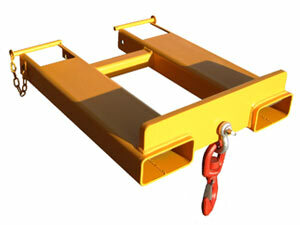 Supplied with safety hook and shackle. The popular models shown below have a distance of 950 mm hook to ground and 5 lifting points 750 to 1750 mm. Any height, length, capacity or mounting type available. 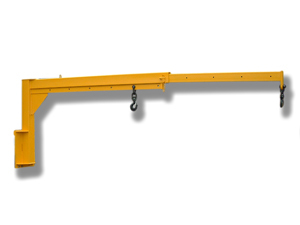 The ultimate carriage mounted jib, providing increased lift height, minimum mast height and the versatility of manual length adjustment (hydraulic adjustment also available). 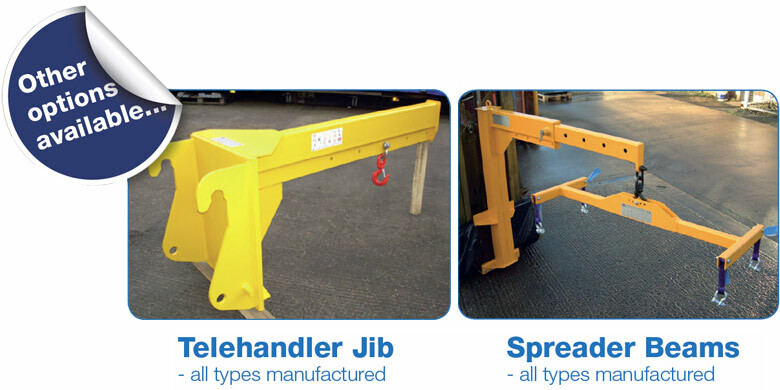 Ideal for handling machinery and very long loads. Supplied with safety swivel hook. The popular models shown below have a distance of 950 mm hook to ground and 10 lifting points at 750 to 3000 mm. Any height, length, capacity or mounting type available.